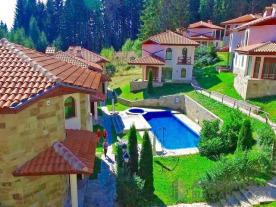 Cosy 2- storey mountain house with nice panoramic views, situated in the gated modern complex Pamporovo Village, 15 km from the town of Smolyan. The distance to the ski slopes is 4 km. 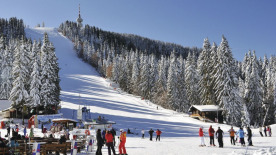 Set amidst beautiful pine forests, it provides excellent conditions for skiing activities and a variety of outdoor activities in any season of the year, as well as recreation and entertainment. A restaurant with a café and an outdoor pool are available on site. 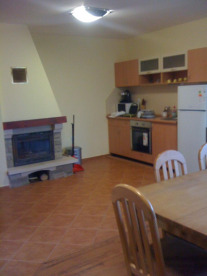 The newly built house was completed in 2006 by high quality building materials and modern finishing. The first level has an area of 55.69 sq.m. and a second level - 62.25 sq.m. The property also includes 1197/3356 shares of 3356 sq.m. plot on which the house was built. 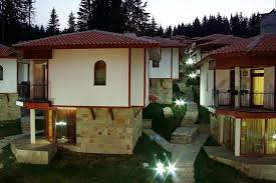 • Second floor with 2 bedrooms, 2 equipped bathrooms with a shower cabin and a balcony with a wonderful view of the woods in the vicinity. In addition to comfortable furnishing, the rooms are finished with laminate, terracotta and carpet flooring, as well as PVC windows. 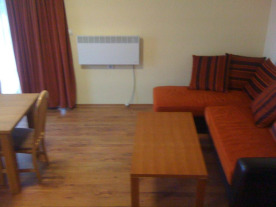 The apartment is heated by a fireplace and electric radiators. There is wiring for TV, internet. The annual service fee is 800 Euro. There is a possibility of parking in and around the complex. 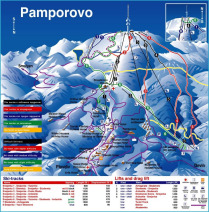 Pamporovo Village is a four-season holiday complex situated in the south-eastern side of Sunny Pamporovo. The complex is a perfect combination of a great number of opportunities for extreme experiences and relaxed idyll for complete relaxation. 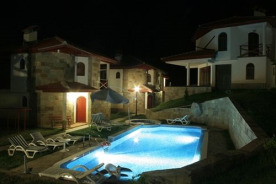 The property is nestled among paradise beautiful scenery and is suitable both for vacation property and for rent.